Peach cobbler season is year-round, right? This recipe works great with fresh or frozen peaches. Amazon offers several brands of Mexican Vanilla. This one's a favorite because of the great value. 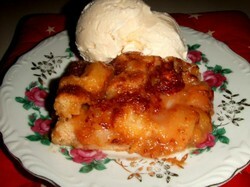 This peach cobbler recipe can be made with sugar or with agave nectar. Either way, you'll get a rich and delicious dessert that will skyrocket your reputation as a pastry chef. Stir together in a sauce pan: 4-5 cups sliced peaches, fresh or frozen, peeled or unpeeled, 1 tsp Mexican vanilla, 2 Tbsp butter, 1.5 cups sugar or 1/2 cup agave nectar, 1/2 teaspoon ground cinnamon; simmer for about 2 minutes; take off the heat and let cool while you mix the batter. Stay with it so the butter won't burn! Bake for 45 minutes at 325 degrees; edges will begin to rise over the filling. 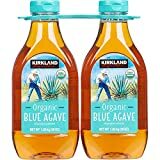 Can't get agave nectar (at a good price) in your neighborhood? Amazon actually has the lowest prices for my favorite brand, Madhava. How to make the best peach cobbler recipe in the world. Doesn't make sense, you say? How can it be the best peach cobbler recipe ever, and then still have room for improvement? Let me explain. The "sugar version" in itself is already a winner. By replacing the sugar with agave nectar, you take advantage of the moisture-retaining and flavor-enhancing qualities of this all-natural sweetener. Thus you create an even better peach cobbler. chefkeem, Thank you for the instructions, pictures and products. What drinks do you serve and what ice cream would you recommend for someone who dislikes, for incomprehensible reasons, vanilla? P.S. Durian can be used but only by locals of Indonesia and Malaysia where there are scent-free durians, as opposed to the smelly zibethinus species that is the only one currently being exported internationally. 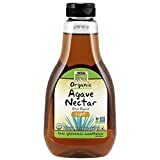 Looks awesome, I have never tried agave nectar. Thank you for the detailed recipe! Karen - highlight the desired text section, and then copy/paste it into your word program, note pad, or whatever you use for your documents. Then print. I might. If I can figure out how to print it on one page! Not durian, the smell! But they taste good. Use any fruit you like (except durian), Marianne. Even berries work great.